For more than a decade, self-checkouts have been gradually popping up in grocery, hardware, general merchandise, and drug stores, even though many consumers dislike them and refuse to use them. Shoppers complain that self-checkouts are inconvenient, confusing, and pose accessibility issues for the elderly and disabled, and they don’t like to see people being replaced by machines. Some consumers choose to use self-checkouts. But for the most part, these devices have not caught on the way that retailers had hoped. Now, in a renewed effort to cut labour costs, some companies are trying to force Canadians to use self-checkouts by purposely understaffing cash tills, asking customers to only use cashiers if they are paying cash, and requiring employees to direct customers toward self-checkout lines. Across the country, reports have emerged of stores neglecting to staff cash tills at certain times of the day, and of consumers being asked to use self-checkouts even when they have explicitly stated they would like to be helped by a cashier. 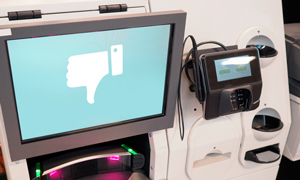 These attempts to “normalize” self-checkouts have been met with considerable consumer backlash, and for good reason. Beyond the fact that self-checkouts can be cumbersome and annoying, many people prefer the social aspect of being able to interact with a cashier. A cashier can help answer any questions you might have about a product and can direct you towards the item that you’re looking for. They can brighten up your day with a friendly “hello,” and inform you about sales and services you might not have been aware of. They help bag your groceries so that you only need to worry about paying when checking out your items. Cashiers provide a valuable service in retail stores, which is why consumers like them. And in unionized stores, a cashier position is often a family-sustaining job that provides benefits, a pension, and income that is then reinvested in the local economy. This means that cashiers not only help retailers meet consumer needs – they also drive our economy. Clearly, the backlash over customers being forced to use self-checkouts suggests that Canadian shoppers want cashiers, not self-checkouts. It also indicates that retailers are losing sight of what their customers want. Given the uproar over “forced” self-checkouts, Canada’s major retailers would do well to listen to consumers by ensuring that cashiers are always available.